Nowadays social media generates a vast amount of raw data (text, images, videos, etc). It is a very interesting challenge to discover techniques to get insights on the content and development of social media data. In addition, as a fundamental component of the analysis, it is important to find ways of communicating the results, i.e. data visualization. 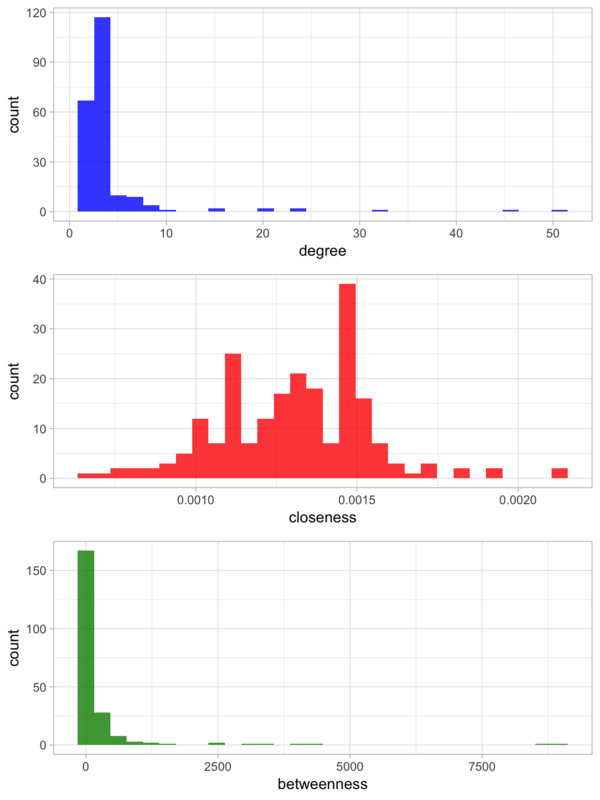 In this post I want to present a small case study where I analyze Twitter text data. The aim is not to give a complete analysis (as it would require many interations), but rather to describe how to to start. The emphasis of this post is in the data manipulation and data visualization. In particular, I describe how networks (graphs) can be used as data structures to describe text relations (some measure of pairwise count occurrences). 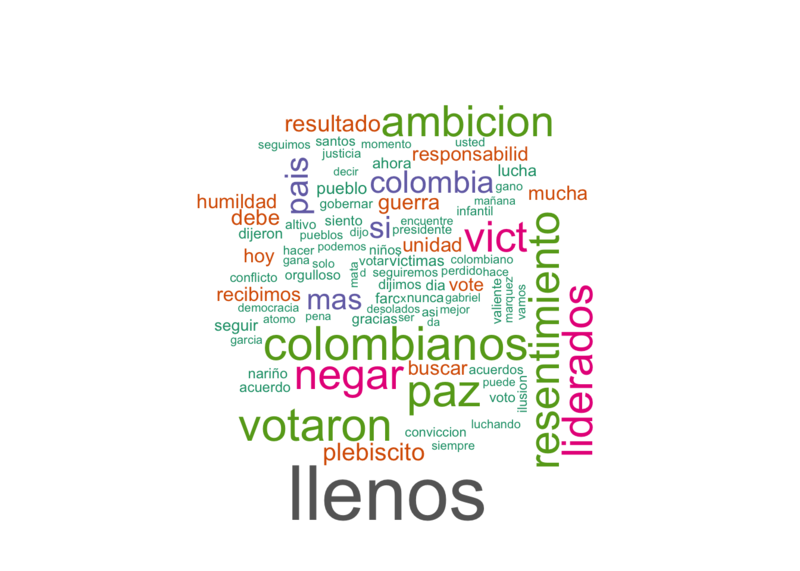 The topic I chose to run the analysis is the Colombian peace agreement referendum (Plebiscito), celebrated on 2016-10-02. You can find more information about it here. In a previous post I described how to get (scraping) the referendum results data per town. The analysis is done in R and it is mainly motivated by the techniques presented in the book Text Mining with R.
Remark: No user-specific data was used. All account references on the tweets were deleted. Let us load the required libraries. # Date & Time Manipulation. # Parse subset of the data into a tibble. # Select non-user related data. # We  do not want to display accounts. Let us see the structure of this tibble. We parse the Created_At column into a date format. Note that in the raw file it has type character. ##  "Sun Oct 02 16:21:03 +0000 2016" "Sun Oct 02 16:21:05 +0000 2016"
##  "Sun Oct 02 16:21:05 +0000 2016" "Sun Oct 02 16:21:06 +0000 2016"
As the Created_At column makes reference to the UTC time, we neet to substract 5 hours from it to get the Colombian time. # We substract seconds, that is why we need three factors. We see that the time frame covered by this data set is essentially the day and the day after the referendum. We create a new variable which “forgets” the seconds of Create_At column. We now plot the time series of tweets count per minute. ##   "Espero que todos los que votaron por el NO mañana mismo se vayan para el monte con su rifle... \U0001f611\U0001f611\n\n#ColombiaDecide #YoVotoSi"
##   "Colombia quiere paz, pero no con tanta impunidad y beneficios. Colombia despertó!! \U0001f64f\U0001f44f\U0001f4aa. #SoyColombiaNO"
##   "Re-coherentes los hptas. https://t.co/UbUeqsUiD6"
##   "Y Colombia botó su voto dejando ganar el no... #ColombiaDecide #HoyVotoSi"
##   "Ay martincito...sos una caricatura! Que pesar! https://t.co/0kokGc52w2"
##   "En las zonas golpeadas por la guerra gano el #SiALaPaz, siento #dolor de #patria #ColombiaDecide #pais #sinmemoria." ##   "Ganamos Colombia #ColombiaDecide no lo puedo creer! #sialapaz #noalplebiscito"
##   "Sé que he cumplido con mi deber, tristemente todos hemos perdido, llamo a la unidad porque en este país cabemos todos.\n#SiALaPAZ ¿cuándo?" ##  "Deberían priorizar los resultados de los lugares afectados por la guerra. Dijeron #SiaLAPaz , no es justo que otros decidan por ellos." ##  "Día triste para Colombia gana el no \ntodo este tiempo fue en vano #SiALaPaz https://t.co/bq36CRvvvx"
##  "Tristesa #SiaLAPazenColombia #SiALaPaz https://t.co/r5yZDFLTC1"
##  "Ganó el #VotoNo #ColombiaDecide\nEs clave saber  qué va a pasar con el proceso de paz y saber si van a renegociar lo… https://t.co/6DqGBz20XF"
##  "#ColombiaDecide #HoyVotoSi \nVivo en el país más ignorante del mundo,\nQue lastima pueblo!" ##  "#DolordePatria \n#HoyVotoSi #VotoSiSinSerSantista https://t.co/CVXZCBNNwx"
##  "el que mas ayudo al #VotoNo fue Mateo, al no poder salir la gente a votar en la costa, bastión de la Mermelada y compra de votos de Santos." ##  "76. Cada cartucho de fusil cuesta $ 1.040 y este dispara 300 cartuchos por minuto, lo que cuestan 900 huevos… https://t.co/NtbpwCZFD4"
##  "Brexit otra vez y los más cuerdos parecen los de las FARC . Incertidumbre para los colombianos #SiALaPaz https://t.co/3wYYyU6wC2"
##  "#ColombiaDecide\nLa decepción electoral debe fortalecernos para desde mañana mismo seguir generando conciencia en favor del pueblo.\n#SiALaPaz"
##  "Porque será que nunca hemos podido aprender a perdonar? Porque será que nos puede el odio y la ignorancia?? #ColombiaDecide #SiALaPaz"
Indeed, the comments reflect the reactions around the referendum results. We want to clean and normalize the text for the analysis. We are mainly interested in the content of the tweets, not the hashtags or accounts. In addition, we convert out text into a corpus to use the tm library. # We could also use stemming by uncommenting the folowing line. # Recover data into original tibble. We now want to extract only the hashtags of each tweet. We implement a function for this purpose. We merge these data frames together. Finally, let us split the data before and after the results of the referendum are known, i.e. we split the Created_At_Round column with respect to the results.time. # "m" will represent before. results.time. # "p" will represent after results.time. We begin by counting the most popular words in the tweets. # Remove the shortcut 'q' for 'que'. # We have some tweets in english. We can visualize these counts in a bar plot. Another popular method to visualize word count data is through a word cloud. We can indeed see how the wording changes in these two time frames. We can run an analogous analysis for hastags. We plot the correspondinng word cloud. 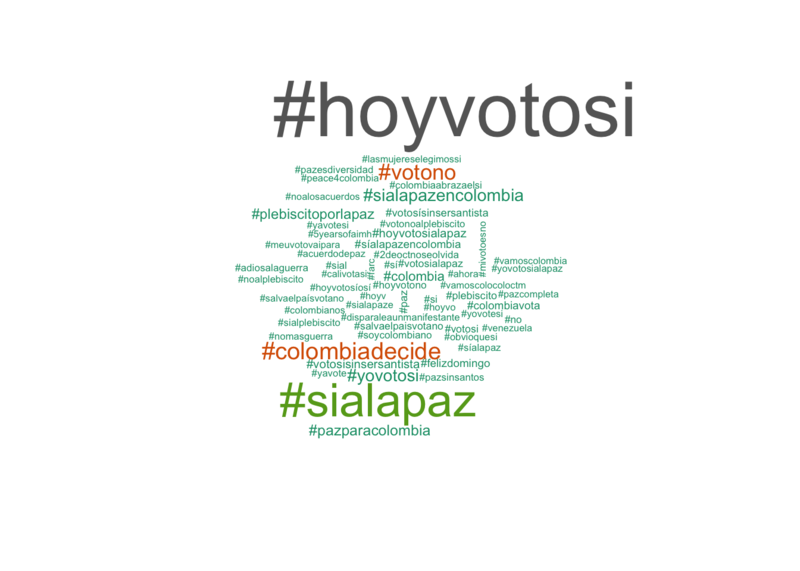 The most popular hashtag for the ‘YES’ and ‘NO’ are #hoyvotosi #notono respectively. Let us see the volume development of these hastags. Overall, the tweets supporting the ‘YES’ had much more volume. But this was not reflected on the results. Remark: Compare with a brief initial analysis on the hastag volume over time. In this section we are going to describe how to encode and visualize tex data as a weighted netwok (graph). The main ideas is to count pairwise relative occurence of words. We want to count pairwise occurences of words which apperar together in the text, this is what is known as bigram count. Next, we filter for stop words and remove white spaces. Finally, we group and count by bigram. 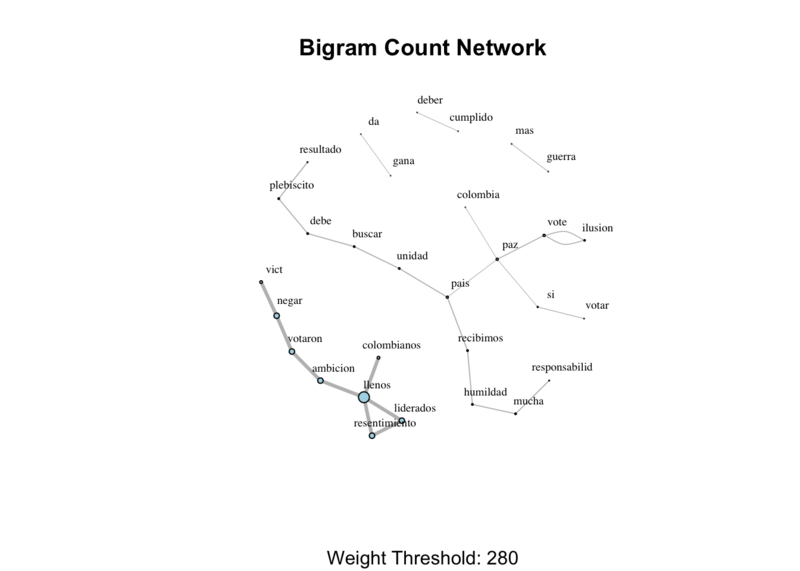 How to define a weighted network from a bigram count? Each word wis going to represent a node. Two words ae going to be connected if they appear as a bigram. The weight of an edge is the numer of times the bigram appears in the corpus. (Optional) We are free to decide if we want the graph to be directed or not. We are going to use the igraph library to work with networks. Remark: The reference A User’s Guide to Network Analysis in R is highly recomended if you want to go deeper into network analysis in R.
We can add some additional information to the visualization: Set the sizes of the nodes and the edges by the dregree and weight respectively. # Compute the weight shares. 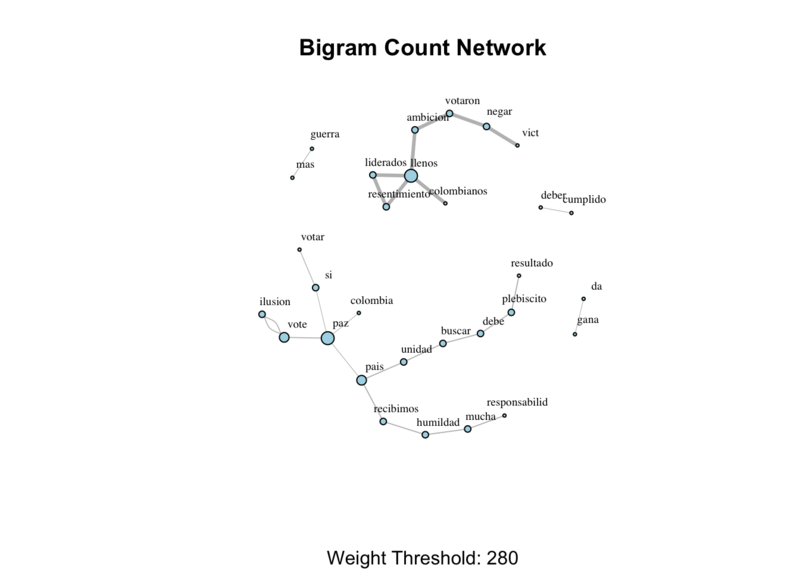 # Scale node size by degree. # Set edge width proportional to the weight relative value. # Select biggest connected component. We can go a steph further and make our visualization more dynamic using the networkD3 library. # Degine color group (I will explore this feature later). Let us now decrease the threshold to get a more complex network (zoom out to see it all!). ##  " voy acercando   puesto  votacion  siento mariposas   estomago siento nervios  felicidad "
We now count the skipgrams containing two words. # Compute the centrality measures for the biggest connected component from above. ##  1 paz          50   0.00211       8673. ##  2 si           45   0.00212       8969. ##  3 mas          32   0.00183       3038. ##  4 hoy          24   0.00191       4206. ##  5 colombia     24   0.00190       3903. ##  6 pais         21   0.00173       2350. ##  7 voto         20   0.00181       2487. ##  8 pueblo       16   0.00172       3318. ##  9 guerra       15   0.00172       1087. ## 10 vote         10   0.00163       1692. ##  1 si           45   0.00212       8969. ##  2 paz          50   0.00211       8673. ##  3 hoy          24   0.00191       4206. ##  4 colombia     24   0.00190       3903. ##  5 mas          32   0.00183       3038. ##  6 voto         20   0.00181       2487. ##  7 pais         21   0.00173       2350. ##  8 guerra       15   0.00172       1087. ##  9 pueblo       16   0.00172       3318. ## 10 vota          9   0.00169        495. ##  1 si             45   0.00212       8969. ##  2 paz            50   0.00211       8673. ##  3 hoy            24   0.00191       4206. ##  4 colombia       24   0.00190       3903. ##  5 pueblo         16   0.00172       3318. ##  6 mas            32   0.00183       3038. ##  7 voto           20   0.00181       2487. ##  8 pais           21   0.00173       2350. ##  9 vote           10   0.00163       1692. ## 10 colombiano      8   0.00143       1253. Let us see the distribution of these centrality measures. ##     "vote"       "ilusion"    "colombia"   "paz"        "deber"
##     "dia"        "niños"      "nueva"      "cumplido"   "acuerdos"
##    "patria"     "ponen"      "dijeron"    "farcsantos" "peligro"
##    "justicia"   "estable"    "construir"  "gabriel"    "garcia"
##    "proceso"    "encuentre"  "mata"       "jaime"      "sueño"
##    "viva"       "social"     "queremos"   "infantil"   "democracia"
##    "duradera"   "marquez"    "garzon"     "solo"       "t"
We see that 12 groups where identified and the modularity is 0.7 (which is good, as it is close to 1). Now we encode the membership as a node atribute (zoom and click on each node to explore the clusters). # We use the membership label to color the nodes. # Get 15 at most 15 words per cluster. ##   "vote, ilusion, colombia, paz, deber, dia, niños, nueva, cumplido, acuerdos, patria, ponen, dijeron, farcsantos, peligro"
##   "pueblo, civilizado, dijo, esquizofrenico, listo, mujica, voltear, siento, valiente, lucha, altivo, dijimos, gobernar, nariño, orgulloso"
##   "si, hoy, votar, voto, sabremos, madrid, derecho, amsterdam, berlin, barcelona, shanghai, sibelgica, valencia, va, vota"
##   "guerra, mas, acuerdo, amor, salida, ahora, cambiar, puede, importante, buen, gobierno, hacer, historia, mal, victimas"
##   "hacemos, acompañan, estan, gaviria, militantes, pacho, espiritu, tc"
##   "hijo, arrebato, intolerancia, leonardo, posada, reina"
##   "llenos, colombianos, ambicion, liderados, negar, resentimiento, votaron, vict"
##   "resultado, debe, buscar, plebiscito, unidad, humildad, mucha, pais, recibimos, mejor, mama, soño, seguir, luchando, conviccion"
##   "da, hace, denuncia, estadio, haciendo, incumpliendo, norma, santos, trampa, gana"
##  "años, enemigo, quede, claro, matado, verdadero"
##  "votamos, familia, ninguna, abuelo, asesinado, farc, perdon, secuestrado, sino, premio, pase"
##  "bandera, carmena, disimula, venezuela, vergonzoso"
The focus of the phi coefficient is how much more likely it is that either both word X and Y appear, or neither do, than that one appears without the other. 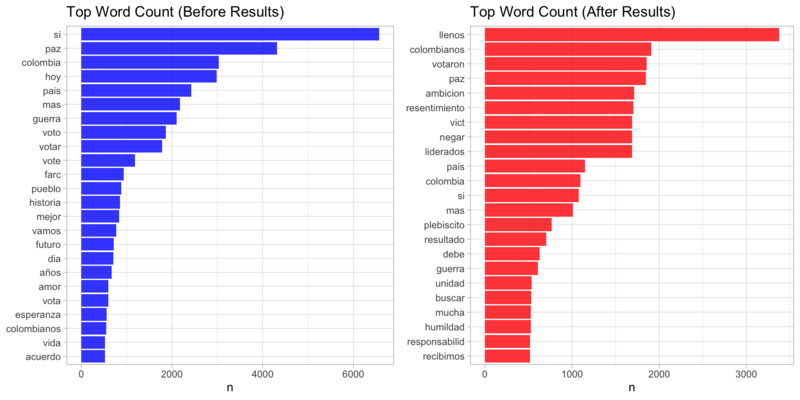 (Text Mining with R, Section 4.2.2). You can read more about this correlation measure here. # filter for relevant nodes. In this post we explored how to get first insights from social media text data (Twitter). First, we presented how clean and normalize text data. Next, as a first approach, we saw how (pairwise) word counts give important information about the content and relations of the input text corpus. 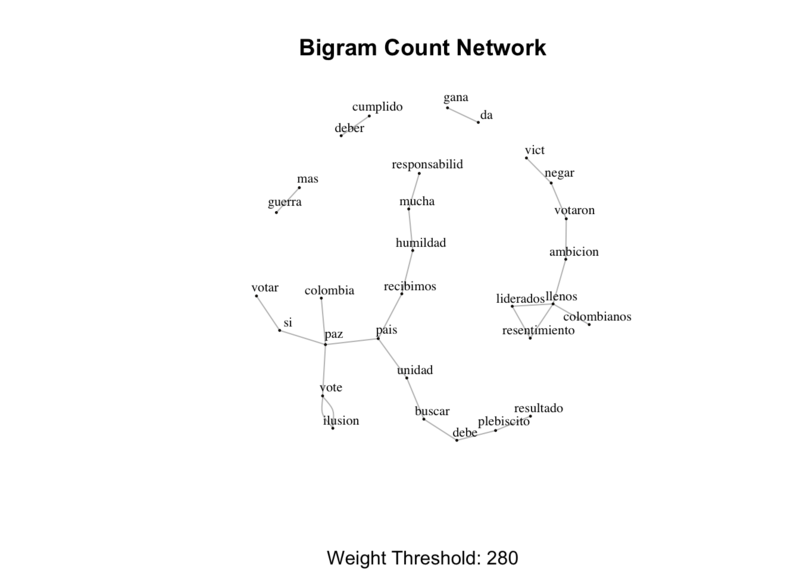 In addition, we studied how use networks as data structures to analyze and represent various count measures (bigram, skipgram, correlation). We also showed how we can cluster these words to get meaningful groups defining topics. But this is just the beginning! Next steps will include going into the meaning and class of the words (part of speech tagging and named entity recognition). We will explore these techniques in a future post.